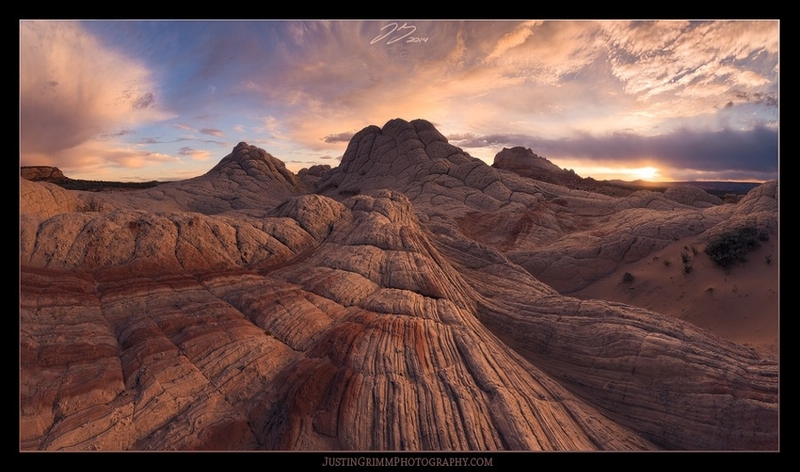 This is shot from the unimaginably interesting and isolated patch of sandstone in Arizona called White Pocket. These one of a kind formations still have not been fully explained by geologists, but the running theory is that they are the result of "soft sediment deformation. Which makes seeing how the multicoloured stone looks like strung out red, yellow and white taffy. Throughout this entire day huge clouds threatened to dump on us, with the possibility of turning the single long road taken here into mush and lengthening our stay. I guess that wouldn't have been so bad, however the rains never did fall. Instead, we were treated to a deliciously sweet 30 seconds of light as the sunbroke below the clouds, just enough time for me to capture this 6 shot wide-angle panorama. Thanks for cheching it out! Superb. Great texture and rich color that isn't overdone. Good post-processing, nice use of the textures in the rocky floor as lead in lines, well exposed sky and not oversaturated colors. No annoying white halos, no fringing, no chromatic aberration leftovers, clean work.